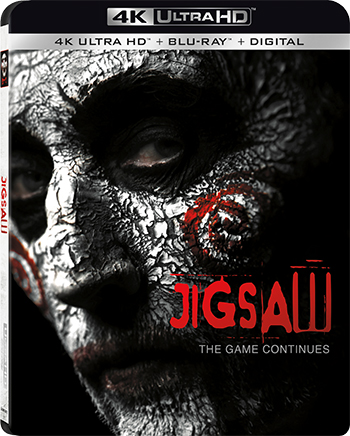 The Jigsaw Killer is back and taking his signature brand of twisted scenarios to the next level when Jigsaw arrives on Digital January 9 and on 4K Ultra HD (plus Blu-ray and Digital), Blu-ray Combo Pack (plus DVD and Digital), DVD, and On Demand January 23 from Lionsgate. Renown genre directors Michael and Peter Spierig (Daybreakers, Undead) and writers Josh Stolberg and Peter Goldfinger reinvigorate one of the most successful horror franchises of all time with their latest installment starring Tobin Bell (Manson Family Vacation, The Firm, The SAW franchise), Laura Vandervoot (TV’s “Smallville” and “V”), Callum Keith Rennie (TV’s “The Man in the High Castle,” “Californication,” Memento), Brittany Allen (It Stains the Sands Red), Matt Passmore (TV’s “The Glades”), and Hannah Emily Anderson (TV’s “Lizzy Borden Took an Ax”). Title Copyright: Jigsaw © 2017, Artwork and Supplementary Materials © 2018 Lions Gate Entertainment Inc. All Rights Reserved.